Repentance is one of the least talked-about topics in Christian circles today, but no less important because of our silence. It’s a critical element in salvation and our eternal destination, so it’s important to understand what it is, and what repentance is not. The word translated as “repent” is metanoeō and literally means “to perceive afterward” with the implication of change. It indicates a change of mind from a previously held view to one for the better. It brings with it the idea that the repentance, or mind change, will be accompanied by a modification in behavior. Change is inherent in the idea of metanoeō. I’m as guilty as anyone of what I call “Scarlett O’Hara repentance”. In the novel Gone With the Wind, Rhett Butler says of Scarlett, “You’re like the thief who’s very, very sorry he got caught, but not at all sorry he stole.” Scarlett O’Hara repentance makes for an interesting storyline and keeps the action moving. It’s good fiction writing. It is not, however, godly repentance. When Jesus calls us to repentance, to metanoeō, He calls us to change both our minds and our behavior. This is not an emotional response to conviction, but an active response of mind and body. 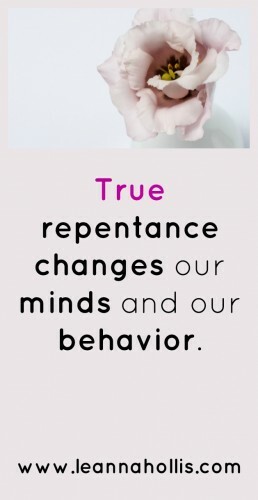 Repentance changes our mind and behavior. For example, if we repent of adultery, we agree with God that adultery is sin and our actions have been sinful. We ask for forgiveness based on our repentance. In our repentance, our mind’s opinion changes. We no longer view adultery as an acceptable behavior. In addition, our actions change and we no longer commit adultery. We completely remove ourselves from the relationship. That’s repentance. Asking God for forgiveness on our way to or from our adulterous lover’s house is not repentance. Adultery is an extreme example, but it holds true for every sin, from pride to unforgiveness to a critical, judgmental spirit. “Thought” sins are harder to change, but by the grace of God, true repentance is possible. “I can’t help what I think” is a commonly-held opinion, but that’s not what Scripture says. “Take every thought captive,” Paul wrote (2 Cor. 10:5). If we take our thoughts captive, when a sinful thought enters our mind, we immediately reject it and turn our thoughts toward those things that are good and pleasing to God. For example, when we encounter someone about whom you have ungodly thoughts, we are to train ourselves to speak (aloud or silently) only that which would be pleasing to God. We are not to dwell on the negative. If we can’t think anything positive, we’re to pray for the same grace toward them that we want toward ourselves. We have two choices concerning eternity. Stay the same and perish. Repent and not perish (i.e. have eternal life). We can’t have it both ways, so we must choose wisely. Repentance is the only sensible option. We will all decide. Repent or not. Which will you choose? Thanks for sharing your time with me today! I’ve glad you stopped by. If you enjoyed this content, follow me on Facebook or sign up for the twice-monthly mailing list (below) to be notified about my future blog posts (or both). Before you leave, would you mind taking a moment to pin to Pinterest and share on social media? It helps extend my digital reach in ways I can’t do myself. Thanks again! See you soon.